Many hummingbirds spend the winter in Central America or Mexico, and migrate north to their breeding grounds in the southern United States as early as February, and to areas further north later in the spring. Hummingbirds fly by day when nectar sources such as flowers are more abundant. Flying low allows the birds to see, and stop at, food supplies along the way. They are also experts at using tail winds to help reach their destination faster and by consuming less energy and body fat. Research indicates a hummingbird can travel as much as 23 miles in one day. During migration, a hummingbird's heart beats up to 1,260 times a minute, and its wings flap 15 to 80 times a second. To support this high energy level, a hummingbird will typically gain 25-40% of their body weight before they start migration in order to make the long trek over land, and water. The first arrivals in spring are usually males. Some, however, do not migrate, in areas like California and the upper Pacific coast. We are monitoring the Spring 2019 hummingbird migration with the help of our viewers as they submit their first hummingbird sightings in their areas. During 2018 we received over 6,500 "first sighting reports" and were able to post 3,200 to our migration map. The map has now been viewed over 5,625,000 times during the six years we have monitored the hummingbird migration! Shown below is our current map of hummingbird sightings in 2019 across the U.S. and Canada, as reported by our website viewers. 2019 Ruby-throated Hummingbird Migration in the Eastern U.S. 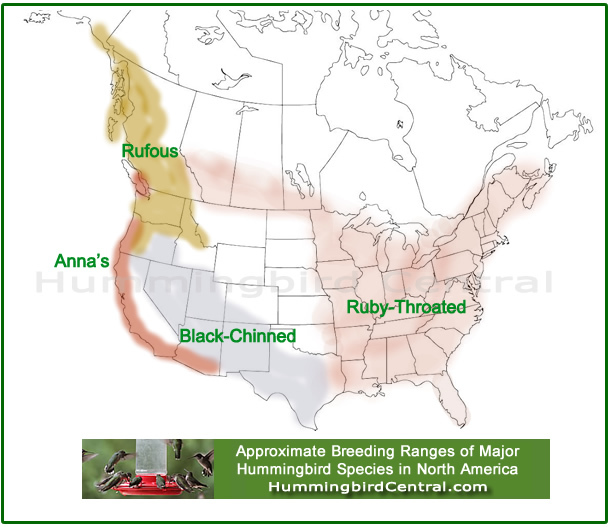 The map below shows the approximate breeding ranges of four major hummingbird species in North America: Rufous, Anna's, Black-chinned and Ruby-throated. Of course actual breeding areas vary by year depending on weather-related conditions and other environmental factors. During migration, a hummingbird's heart beats up to 1,260 times a minute, and its wings flap 15 to 80 times a second. To support this high energy level, a hummingbird will typically gain 25-40% of their body weight before they start migration in order to make the long trek over land, and water. They fly alone, often on the same path they have flown earlier in their life. Young hummingbirds must navigate without parental guidance. Strong cold fronts moving south over the Gulf of Mexico make flying difficult as the birds deal with headwinds and heavy rain, over long distances with no shelter. Food is non-existent over the open waters. By August and September, hummingbirds are moving south, refueling their bodies in the early morning, traveling midday, and foraging again in the late afternoon to maintain their body weight. Ruby Throats gather in Florida, Louisiana and along the South Texas coast in September in preparation for the final push to the south, either over the Gulf of Mexico or via an overland route through Mexico. The Rufous hummingbirds head south, most via the eastern range of the Rocky Mountains.